You left me thirteen years ago, exactly half of my life now. I had no idea I would be getting married thirteen years later. I miss you. I miss you so much. I miss you like I’ve never missed you before. You were supposed to be here. You were supposed to be here to ask SM about his math grades. You were supposed to be here to over indulge in food with his dad. You were supposed to be here to witness my nikah. You were supposed to be here to give me away during the rukhsati. But you’re not. And it breaks my heart. I’ve never felt this pain before. It hurts so much. All I want is for you to be here. To see me as a bride. To meet him. When I took him to the graveyard that cloudy day, and the sun came out of nowhere, I knew that that was you, telling mom and me, through the rays of light, that you approved. That was so special. When I went to Pakistan, your sister took me sari shopping. She threw a dolki for me. Your nieces showered me with wedding gifts. Your brother seemed apologetic. He says he’s coming to the wedding. I know you would want me to forgive him. Seeing them all, after so many years, made me miss you even more. I don’t know how I’m going to get through the wedding. Tears are streaming down my face as I write this. I’m trying so hard to bring you into it all, as much as I can, even though you won’t be there physically. We put your picture and bio on the wedding website. Instead of giving favours to the wedding guests, I’m making a donation to the Canadian Cancer Society in your honour. I thought you would have liked that. I’m going to have your picture on our receiving table. I want all the guests to see you. I want them all to know that you made me. After you died, my biggest fear was that I would forget you, because I was so young. Now I’m older, and I know that’s impossible. I can’t forget you because you are a part of me. You will always be a part of me. And you will be a part of my children. I promise you that I will make sure they know all about you. That they know what their nana-abu was about. This is all so hard without you. Planning my wedding is hard without you. I know it’s supposed to be a happy time, but the void I feel because you’re not here makes even this happy time a little bit sad. I love you. I wish I had told you that more when you were here. And you mean so much to me…I wish I told you that more when you were here, too. I know that on the day, you will have the best seat in the house. But all I will really want is for you to be sitting next to me, and my husband-to-be. Inna lillahi wa innah ilayhi raji’un. This post was inspired by Sidra Ruby Ahmed of Rubies and Ribbon. She authored a beautiful letter to her late father about her wedding, and inspired me to do the same. Wow Safa, i came across your blog today and i have been reading everything from top to bottom and its just amazing. And coming across this post i felt i had to say something. I am so sorry to hear about your father, i had the same happen to my father when i was 12 and the fear of forgetting him was with me, but its impossible like you said. 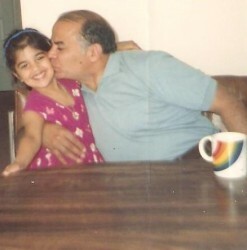 I love the idea of you donating to the Cancer Society, gives me an idea of how to honor my dad. Thank you Safa.